The last stop aboard the Summit on our week-long cruise was in the US Virgin Islands (USVI), St. Thomas, the largest of the US islands. Celebrity truly saved the best for last and better yet, this gem belongs in the States! The port where we landed was Charlotte Amalie, the capital of the USVI. There are a handful of high-end boutique shops, but not much else nearby. 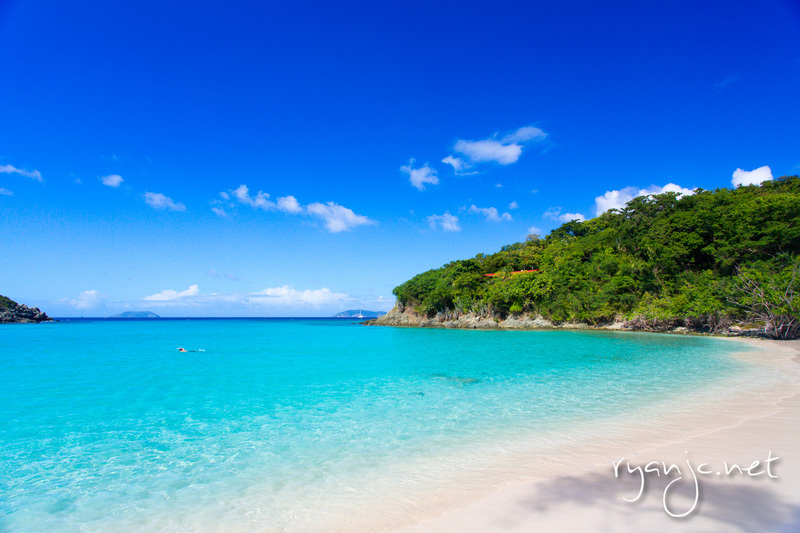 The main attractions are either Megan’s Bay or Trunk Bay (on St. John). 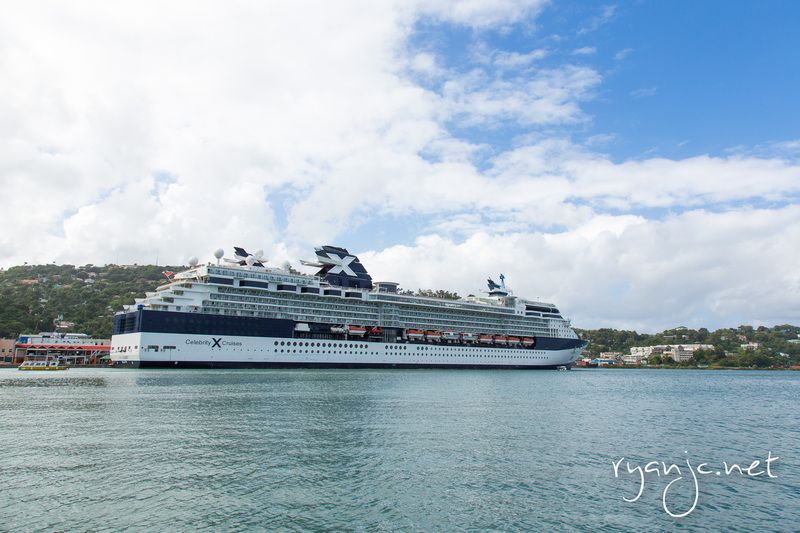 We opted to take a Celebrity excursion tour to St. John, about 30 minutes away from the ship. It’s well worth it to pay a few extra dollars to take the ship’s excursion so they guarantee that you be back to the ship before it departs. 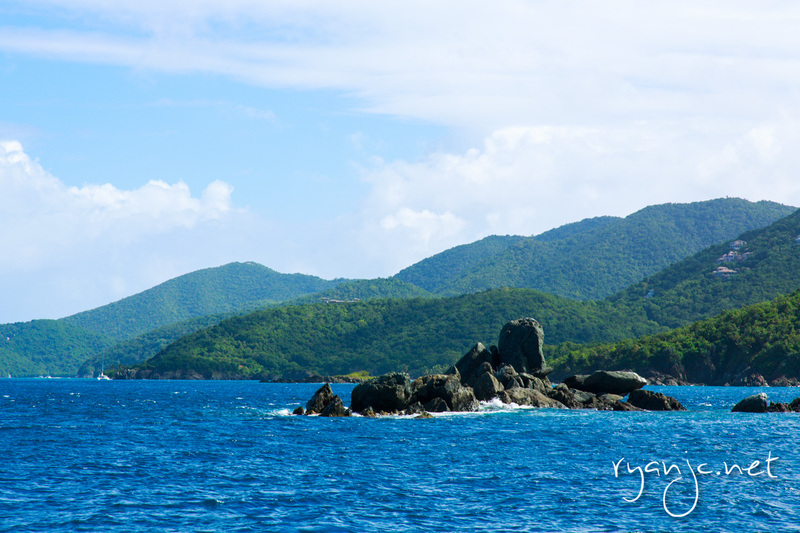 St. John is also fairly easily accessible by a public ferry that run between the two islands. Our tour lead us through the Caribbean Sea to Cruz Bay. The guides were knowledgeable about the history and pointed out significant historical landmarks along the way such as where Christopher Columbus crash landed in the “new world” and who owns what pristine ocean-view property. The captain also mentioned how the USVI was purchased from Denmark for $25M in gold in 1917, coincidentally the first time the US went into debt. With the view and pristine beauty of the islands, I’d say it was absolutely worth! 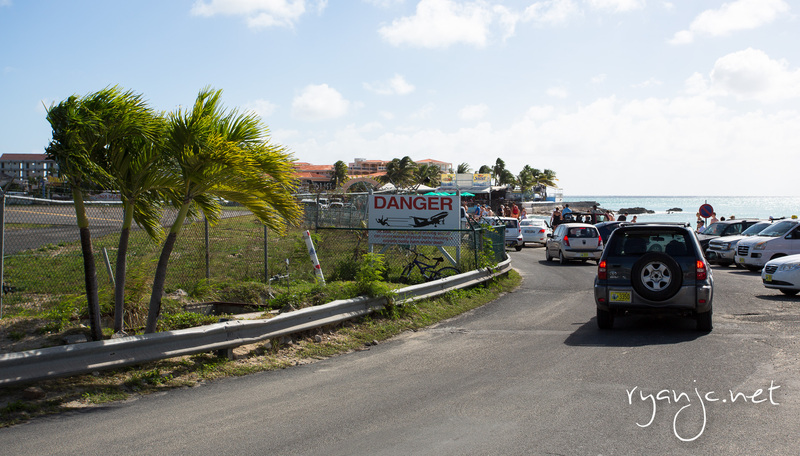 Once you get to Cruz Bay, there are several open-air taxis (jeeps) waiting to take you into the Virgin Islands National Park that encompasses most of the island. Before the park was established, there were a few residences established and they have since been grandfathered making them very valuable to own and rent. 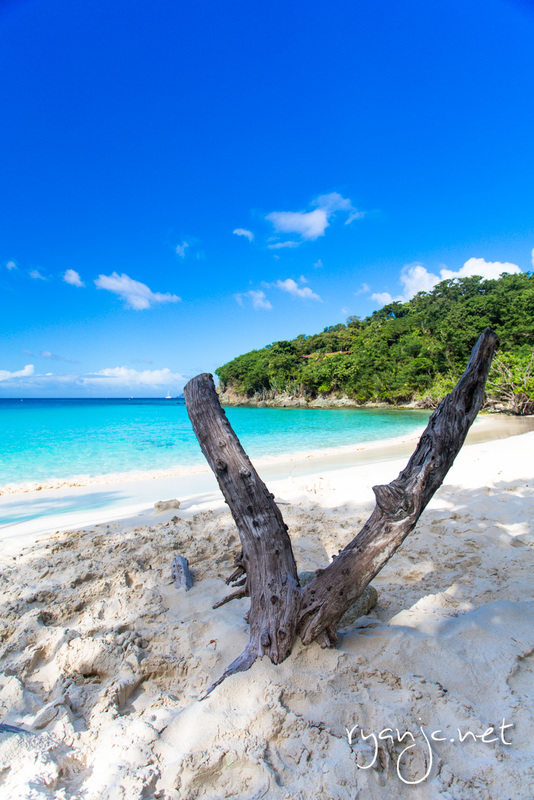 The island is mostly undisturbed and the roads are never have any traffic (definitely another win for this Caribbean destination). 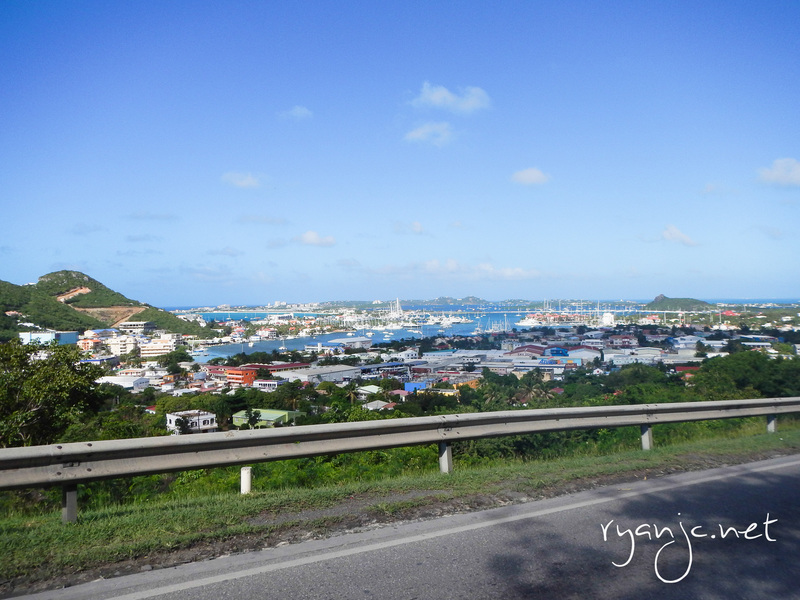 The main street (North Shore Rd) winds through the northern edge of St. John and has lookouts along the way that the taxi stopped allowing us ample time to snap some breathtaking photos of the view. Your wedding here for $20,000 a day, if you can find an opening in their calendar. At the top of the first hill overlooks Cruz Bay where our boat dropped us off. I didn’t realize how much color and how beautiful it was. Taking a step back to take it all in is quite special. 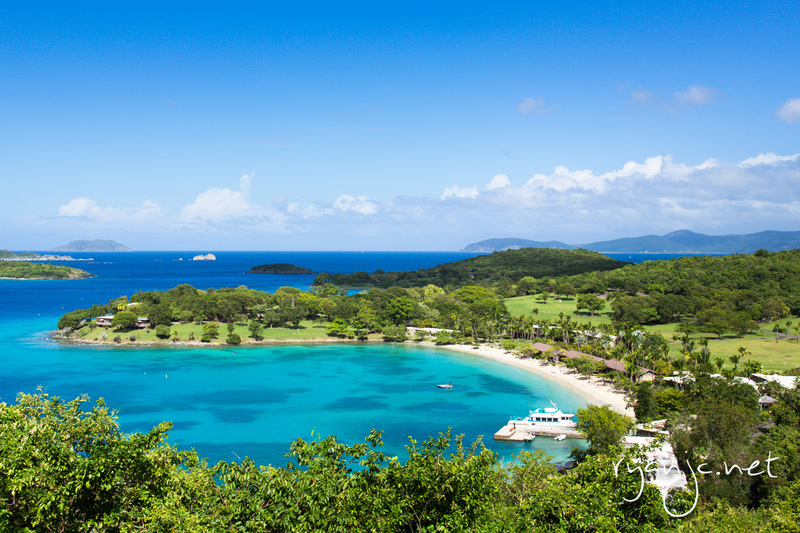 The next overlook was Caneel Bay. A private beach that hosts weddings for a bargain price of $20,000 to rent for the day. The last overlook contained the million dollar view that we had been waiting for all week, actually, salivating over for weeks prior to the trip. 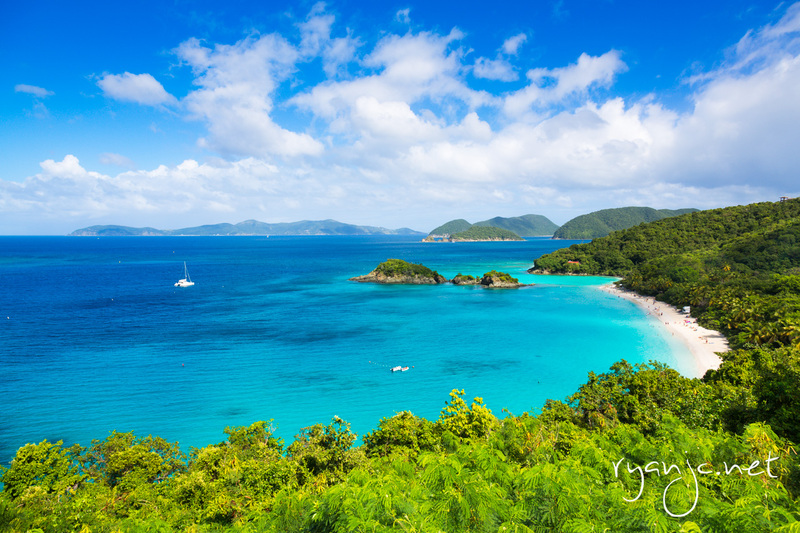 Words cannot comprehend just how incredible the view is of Trunk Bay. As much as I would have loved to sit there and take it in for the rest of the day, the driver beckoned us back into the car and we were off to swim in the bay. Map of the underwater snorkel trail. Admission for the day is $4, kids under 16 are free. They have plenty of showers, restrooms, and changing areas to use. The beach itself is a narrow stretch of soft sand. There is some shade under the trees towards the back of the beach. Oddly enough, it rained while we were on the beach and we found ourselves taking cover under the trees to prevent from getting wet … on the beach. After a quick shower silliness, we went snorkeling for the rest of the afternoon and it turned out to be a perfect day. 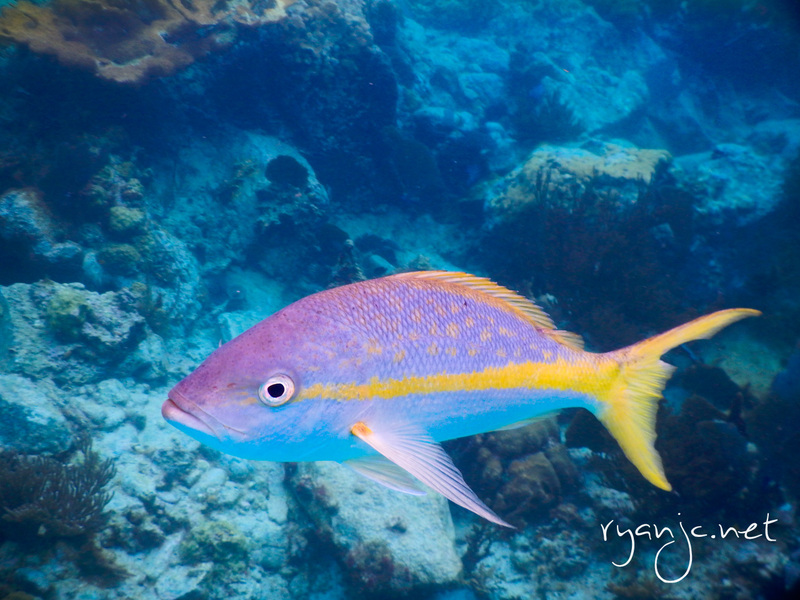 The water in Trunk Bay was the clearest all week and the area was teeming with aquatic life. Thus far, I hadn’t been too impressed with the fish, coral, and clarity of the Caribbean, but this day really made the trip. I’ve only gone snorkeling in the Western Caribbean where there wasn’t many fish either and Phuket, Thailand where the water was extremely clear and abundant with life. To be fair, the Caribbean is known for its beaches and not it’s snorkeling. 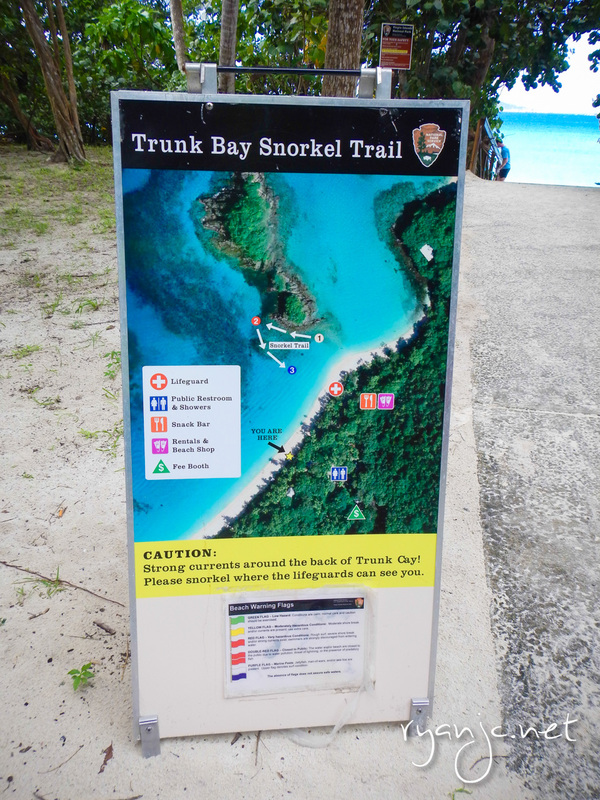 The park has an underwater trail that you can follow that leads you around the aquatic life and points out some of the interesting coral formations. The bay itself is well enclosed on the sides and there’s a small island to prevent it from getting too wavy. It’s definitely a great area for beginners. I turned around and this guy was swimming straight at me and scared the crap out of me. The afternoon quickly came to a close as it was time to start heading back to the ship. On the way back, I snapped this gem of the top of the taxis. It adequately sums up island living. On the boat back to the ship, it started getting cloudy and rained again. We were lucky to have spent most of the day out of the rain! 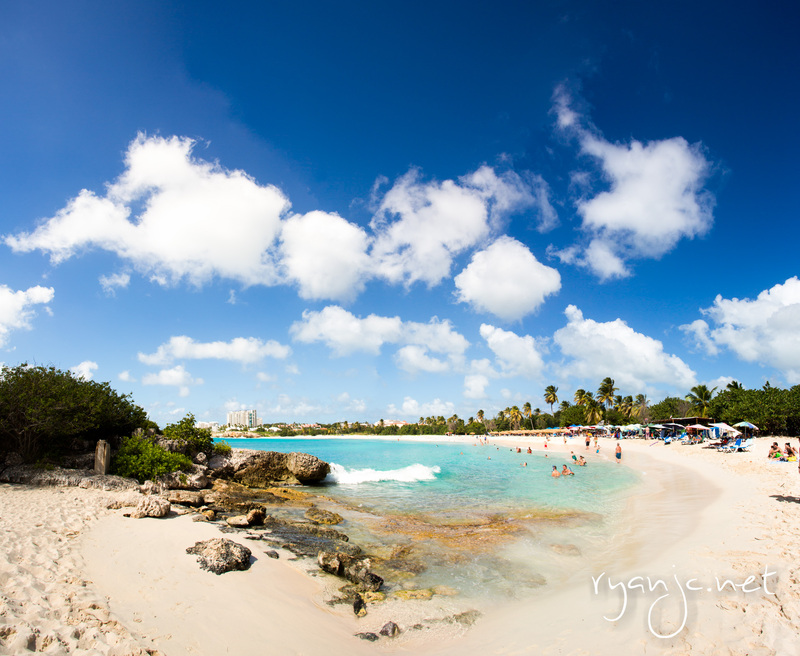 The next port of call was the Dutch/French island of Sint Maarten / Saint Martin depending on which side you visit. Ships usually all dock on the southern point of the island on the Dutch side in Phillipsburg. 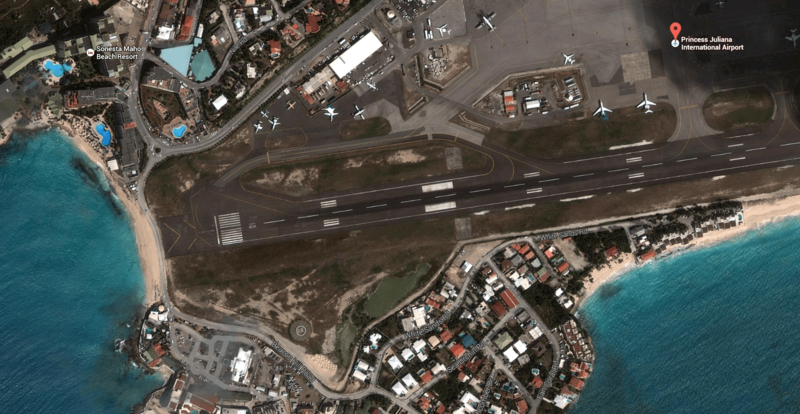 St. Maarten is a highly developed and commercialized island. Out of the entire trip, I would say it has the most development in thanks due to its famous international airport, strong European influence, and that it’s a very popular cruise destination. It’s also home to one of the top Caribbean medical schools, AUC. 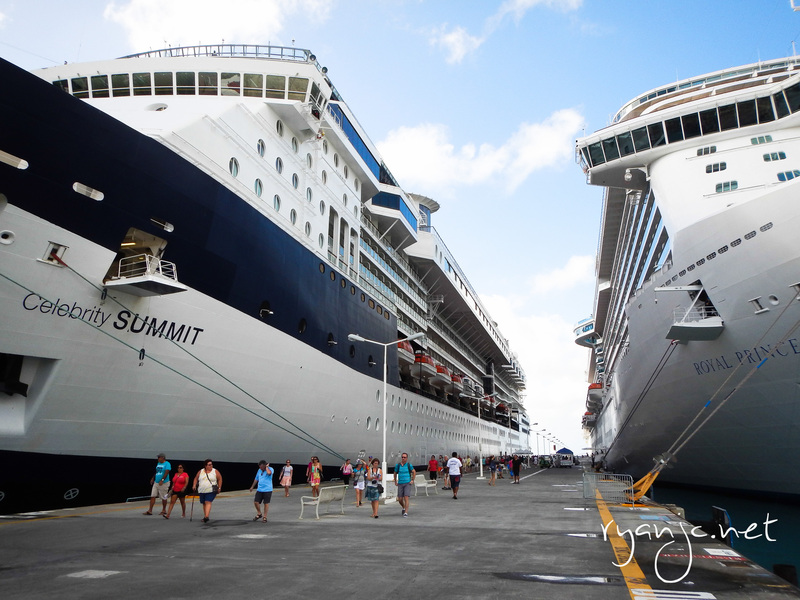 The day we arrived, there were at least 3 other giant vessels – Princess’s flagship vessel, the Royal Princess, Royal Caribbean’s Freedom of the Seas, and the MSC Musica Four large ships is not unheard of for such a busy port. In fact, it’s a relatively lighter day since the port can handle up to six to seven large cruise liners. It’s usually best to consult the Cruise TT timetable while planning your trip to gauge how crowded the islands are upon your arrival. Getting around the island is easy. English is widely spoken and people are friendly, almost too friendly (more on that in a second). The island is so commercialized and developed that it makes for doing your own self-guided tour a breeze without booking an excursion through the ship, hence the going Dutch title. We wanted to visit the western part of the island and had planned to take a public bus from Phillipsburg to Mullet Beach. And by bus, I mean minivan the size of an airport shuttle. Walking the city streets, there are no officially designated bus stops, you just have to flag down the right van going to where you want to go. We were able to hail and empty one and hopped in. The fare was a very reasonable $4 USD for the two of us, each way. We were the first on, but definitely not the last. As we drove across the island, it quickly filled up. There were three rows of seating and each became filled with four passengers. With the driver, we had fourteen people in this little van. It was a tight squeeze under the warm sun, but somehow we all fit and everyone was able to make it to their destinations. People getting on and off would also be extremely courteous, greeting each other on the way and helping people coming on and off. When we got to the Mullet Beach area, we wanted to see AUC which was nearby so we walked through a golf course and up a hill leading up to the school. Being the week before Christmas, the school was deserted and we weren’t able to go in to take a look around. From the top of the hill, the school overlooks a large part of the island and the gorgeous waters of Saint Maarten. It definitely looks like a beautiful place to study medicine. Walking back down, we passed a beautiful rocky overlook and walked down to Mullet Beach. 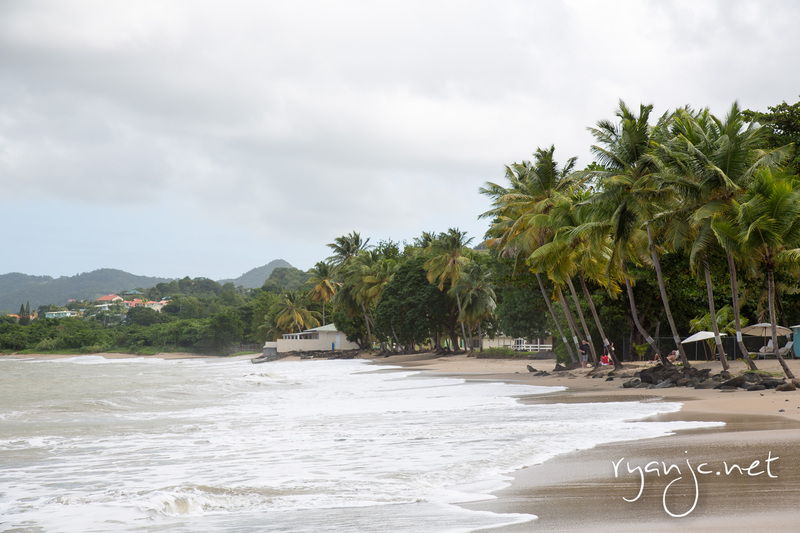 This beach is relatively more remote and less known than Orient Bay on the French side, which draws huge crowds every time. The people on the beach were mostly locals and people staying at nearby hotels, so cruise traffic was definitely at a minimum. 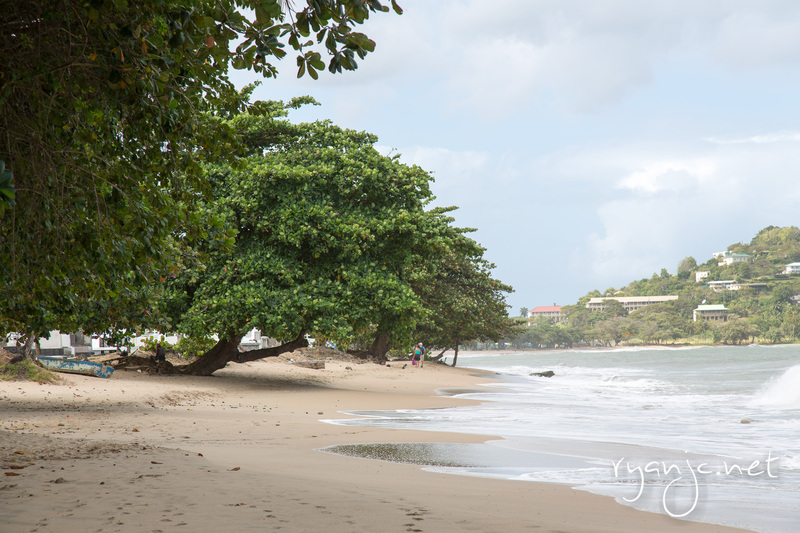 We were able to find a nice mangrove tree on the eastern end of the beach to take shelter. The beach itself is very well protected because it is not facing the open Atlantic side and the water is clear and there were many schools of fish. You can swim 10 feet off shore and follow the rocks as the fish are just congregating around the coral and rock structures. After a couple hours of relaxing on the beach, we wanted to make our way over to the iconic SXM, Princess Juliana International Airport. 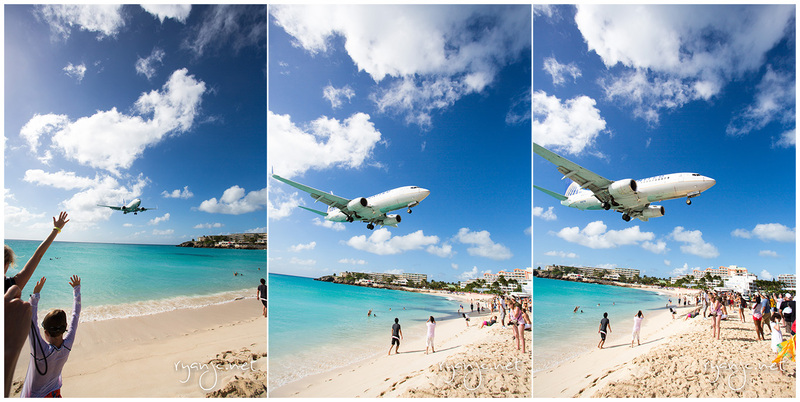 What makes it famous is that at the end of the single runway (Runway 10) is a small sandy beach, Maho Beach. 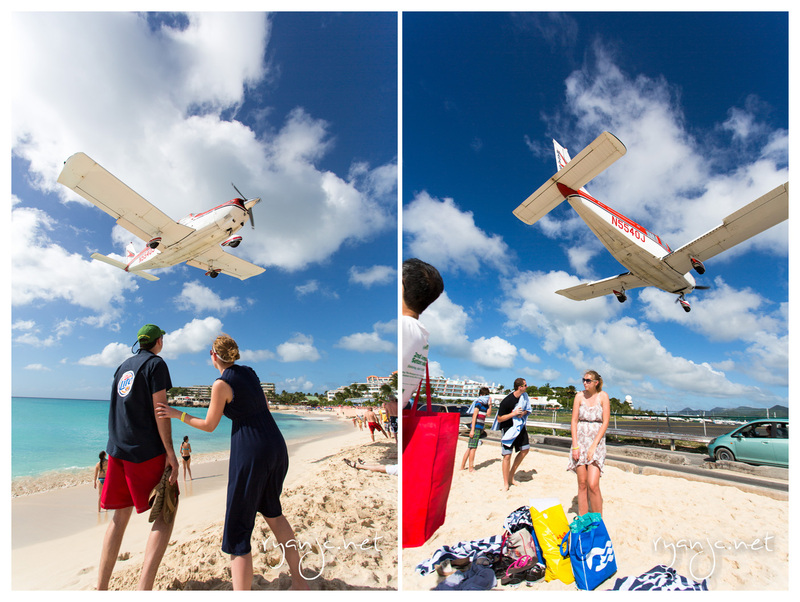 Every day, hundreds of tourists flock to watch landing after landing of commercial and cargo planes land just feet from the beach. Since we spent too much time on the beach, we missed one of the 747 landings for the day, but we did see many other planes come and go. There’s a caution sign for a reason. It’s really something to be standing so close to planes landing just overhead. The pictures speak for themselves as the experience is like no other. The planes come so close to the beach that the bigger ones commonly cause a wake on the water and generate some large waves. Similarly, planes taking off can create an immense amount of thrust that they blow sand and crazy tourists down the beach. There are caution signs all around warning of the blast from these aircraft, but tourists being tourist ignore these warnings and try to get as close as possible and brace the takeoffs. We made such a mistake and let’s just say it will never happen again. On one takeoff by an InselAir MD-83, we could see the pilots happily waving back at all the screaming crowd as the plane made its final turn onto the runway. The plane seemed to take an extra wide turn before positioning itself as far back on the runway as it could go. Before long, the plane was at max thrust and hot sand was blowing everywhere. What lasted less than thirty seconds, felt like 10 minutes. The crowd behind the plane was being sandblasted and blown over and down the beach towards the water. I was quick to duck and cover and tried to make myself as small as possible. I couldn’t see anything in the sandstorm, but I could hear the screams of the crowd and feel the sharp sand as it flew all around me. The aftermath wasn’t pretty. Many people ended up tumbling down the beach into the water, getting a face-full of sand, and getting the wind knocked right out of them. When you go, I suggest standing clear to the sides of the beach and watching all the naïve souls congregating directly behind the jets. You can watch the videos on Youtube of all the poor people tumbling into the ocean as they hang on for dear life. There are several bars and restaurants on southern end of the beach where people watch the planes come and go all day. We departed the airport at about 3PM after deciding to not wait for an incoming Air France 747. We were originally planning on catching a taxi back to the pier but managed to find a bus on the main road back o Phillipsburg. When you go to further parts of the island, you have to be mindful of some of the bridges that raise for fifteen or so minutes about 6 times a day. This can lead to long traffic delays and you do NOT want to be late back to your ship. Since we gave ourselves plenty of time, we had an extra hour to walk around the shops and beach by the pier. It was an incredible day unlike any other. The beach we picked out to visit was gorgeous and the experience of standing at the end of an international airport runway was unforgettable to say the least. Watching the videos of the planes taking off and landing prior to our trip had me so excited for the experience and I definitely look forward to going back not only for it but also the Saint Maarten beaches. 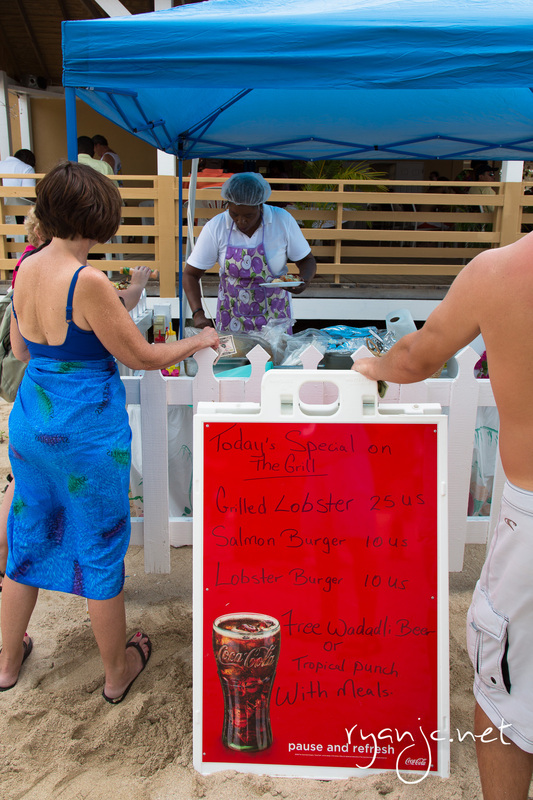 St. Maarten definitely ranks as the number two island of the voyage after St. Thomas (the final island). On Wednesday of our week long voyage from San Juan, Puerto Rico, we reached the gorgeous island of Antigua. Our excursion through the day was booked through the ship as it provided a guided bus tour across the length of the the island to Shirley Heights Lookout, then down to Nelsons Dockyard, and lastly to Turners Beach on the southwest tip of the island. Formerly a British colony, Antigua is known for many things; a haven for celebrities like Oprah, Eric Clapton, Armani to name a few, two medical schools, banking, online gambling, and above all else, their 365 beaches, one for every day of the year. Our bus ride through the island up to Shirley Heights Lookout was a very relaxing countryside drive. After leaving the busy city of St. John’s, we left the traffic behind and drove through the winding country roads and rolling green hills. The island has several parishes each with small communities along the way. There are numerous churches and colorful buildings. 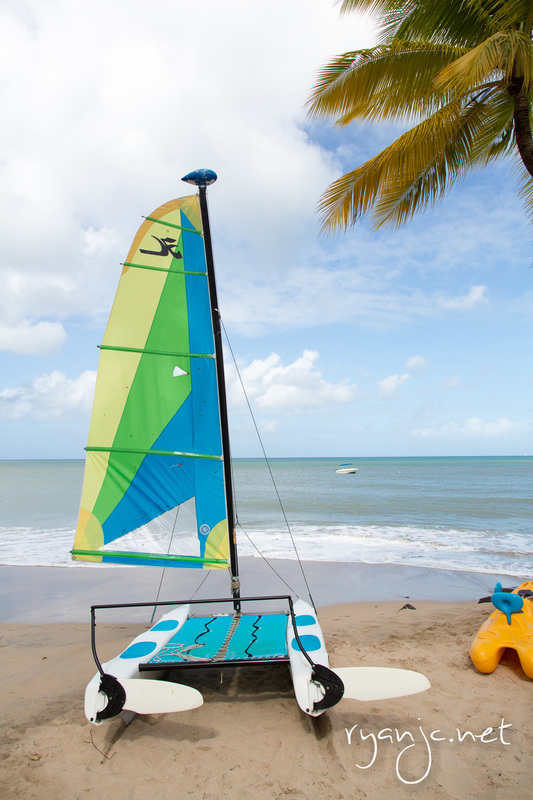 Unlike the crowded city of Castries, St. Lucia, Antigua seems like a much more laid back country where people are easy going and live a simpler life. The houses have doors and windows open and it feels like a very safe place. The breathtaking view from the top is unbelievable. After Shirley Heights, we drove down into Nelsons Dockyard for a tour of the colonial dockyard and drink, courtesy of the tour. 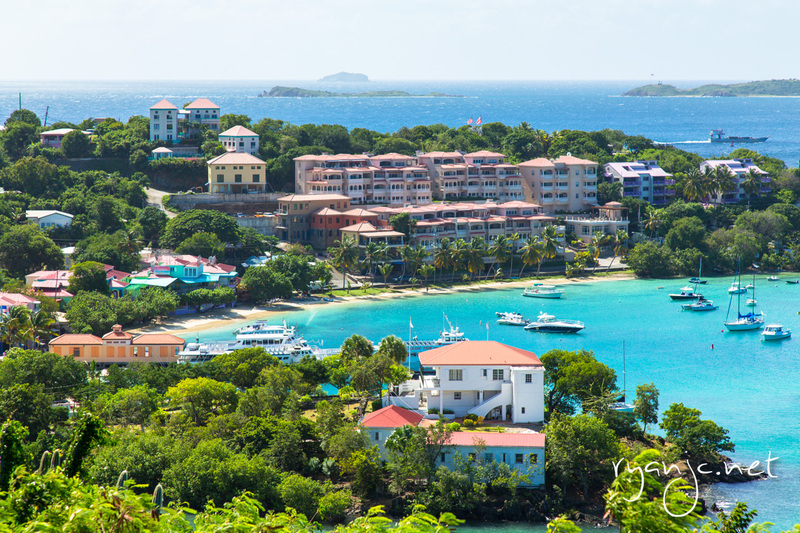 It’s an old colonial British port and is now home to many yachts and impressive sailboats. From there we drove back north towards the center of the island then east to Turners Beach. On the way there, the guide talked some more about the local economy and some of the native fruits on the island. Antigua is well known for it’s “black pineapple,” said to be the sweetest on earth. The outside is slightly darker, but it looks like any other pineapple on the inside. Unfortunately, I didn’t get to try any, but I definitely will make it a point next time! This last leg of our trip took us through the Fig Tree Drive. They’re not actually figs but rather bananas. On Antigua, they use the two fruit names interchangeably. The last and most relaxing stop for the day was Turners Beach. The water was cool and very refreshing. The beach was quite busy, but we managed to find some shade under a cabana which we shared with a German couple from our ship on holiday for Christmas. 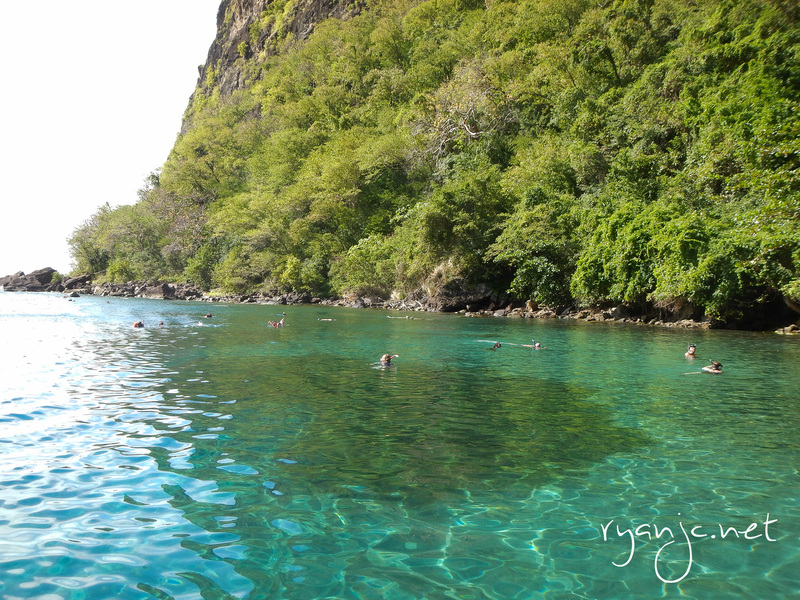 The water wasn’t very clear and there was not any coral to be seen so snorkeling didn’t yield much in the way of fish. 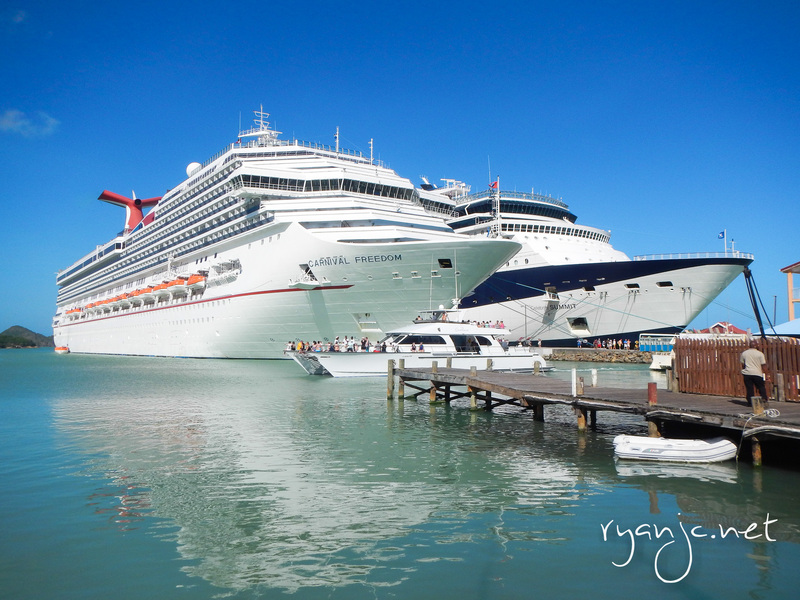 Back to the port of St. John’s, Antigua, we walked around the shops. There was festive Christmas music playing and the port was quite busy with several large ships in town. 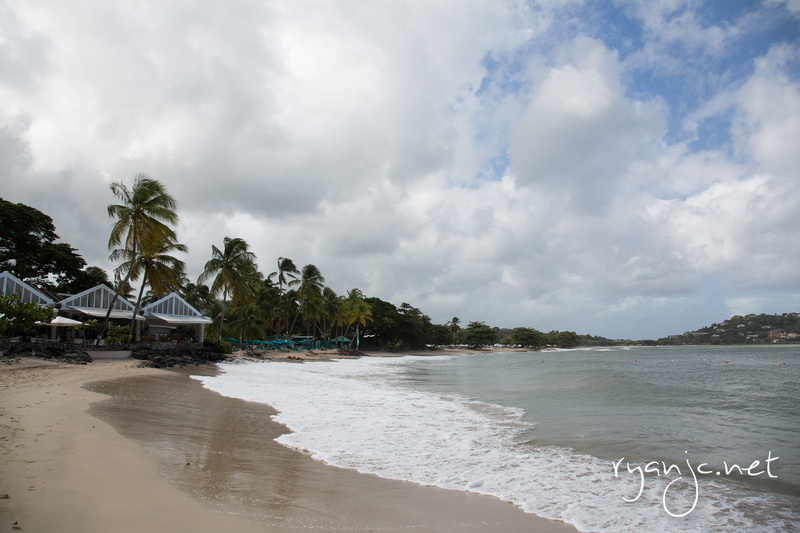 I was surprised how modern the island is compared with the previous day of St. Lucia. There were some high end shops, plenty of familiar western brands, wifi cafes, electronic and camera stores, and lots of small casinos. The island is full of life, color, and interesting British history as an early settlement. Chinese retaurants are everywhere, this one even has a casino! 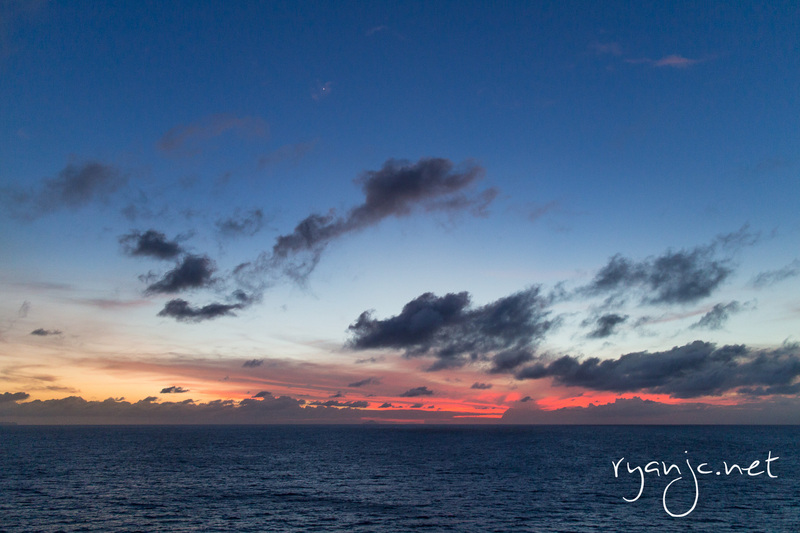 Sunset back aboard the Summit was beautiful as we departed from the island of Antigua. 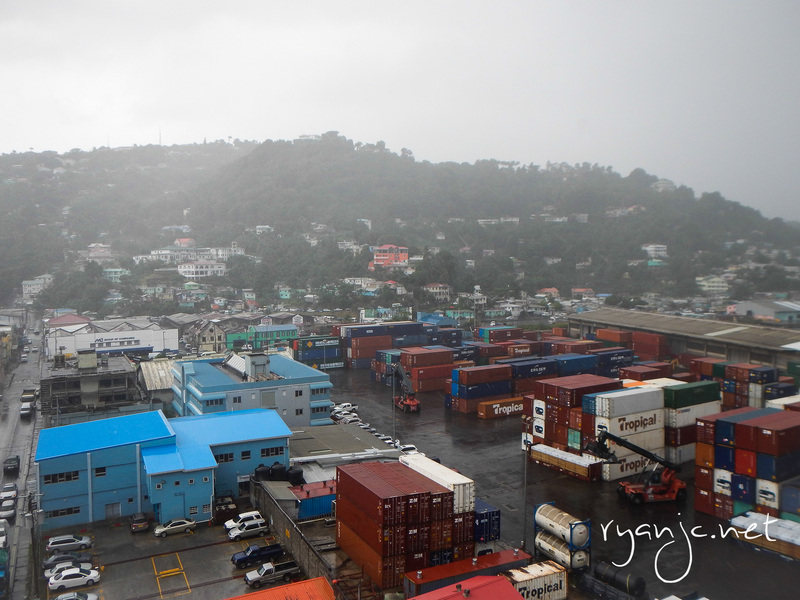 Our second island stop brought us to the island of St. Lucia and the capital port city of Castries. We started the morning a bit late and was surprised to wake up in the port. The city is larger and much more developed in the sense that there are more buildings and roads in the city. In walking through the city, it wasn’t as clean or maintained as well as Barbados. Out of all the islands we had visited during this trip, it was probably the poorest this was probably the most indigent. That’s not to say the island doesn’t have some expensive resorts (such as Beaches, which you see advertised on TV all the time). There’s a visibly large economic gap on many parts of the island. As the island depends on tourism, they really welcome the ships that stop each day. So much so, that you will be bombarded by tour operators and vendors as you exit the terminal. Our excursion for the day was in the afternoon so we spent the morning walking to the nearby Vigie Beach. It’s the closest beach to the cruise terminal, well within walking distance (about 20-30 minutes). It would be much closer were it not for an airport situated parallel to the beach that you have to walk all the way around. The walk takes you through the city, along the terminals where the ships dock, and past the airport. Not all the sidewalks are well paved, so watch your step. Vigie Beach may be the closest, but it’s probably not worth going to unless you’re short on time. 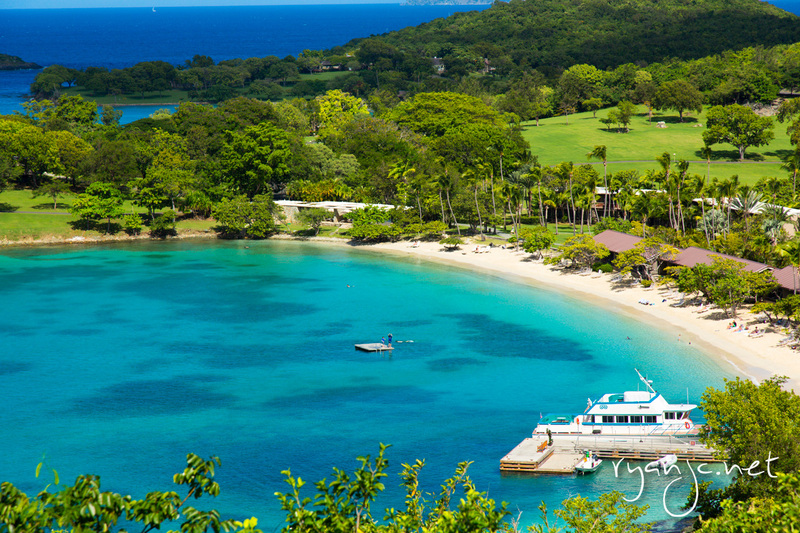 The only thing to be found on the beach is the Rendezvous couples resort (which goes for $800+ a night) and a cemetery. Walking along the beach and accidentally through the beach in front of the resort, we were shooed off by an unfriendly security guard. I suppose the beach is swimmable, but it’s quite rough as it faces north, towards the open water. There’s not much sand to enjoy either. On the opposite end of the resort sits the cemetery. There were locals cleaning the cemetery and sweeping the beach. They did a great job of keeping it clean and free of litter, leaves, and seaweed. One gentleman waved us welcome into the cemetery with his large machete as he saw us looking. We politely declined and kept walking, a bit faster than we had before. Lots of trees line the beach. The tide rises past their roots. Once we made it to the end of the beach, we were very underwhelmed and caught a taxi from the airport back towards the city. We got off at the Basilica of the Immaculate Conception. 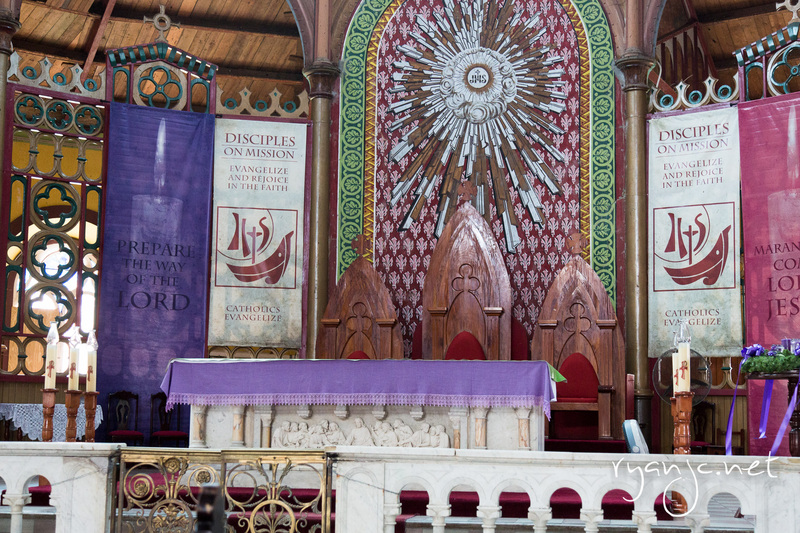 It’s the largest church in the entire Caribbean and the second highest ranked attraction on TripAdvisor. It’s a beautiful cathedral decked out in all sorts of wood. 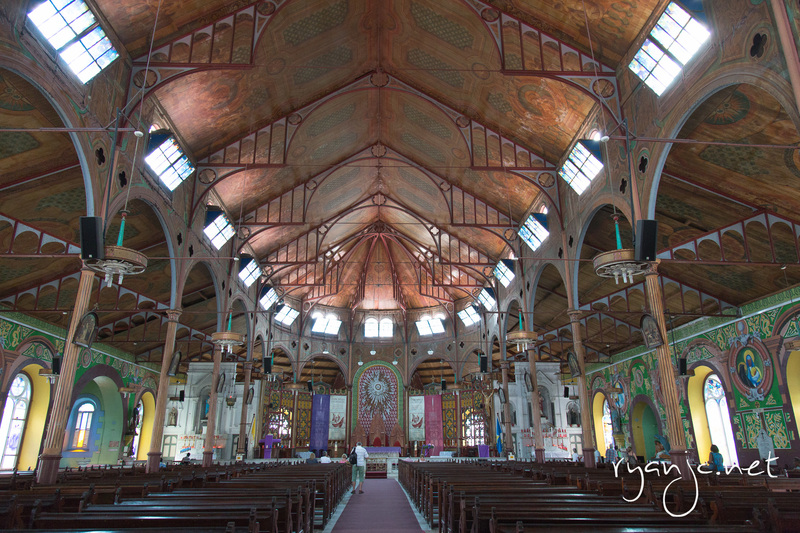 Unlike all the churches in Europe, this one has no stone or granite, just elaborate rich wood decorations. As we were leaving the cathedral, it started to rain, so we hurried back to the ship to find something to eat for lunch before we had to meet our tour. By the time we got back to the ship, it had started pouring. The skies had opened up. You couldn’t even see the city anymore through the dense rain. About twenty minutes later, the rain stopped and the skies slowly parted as sunlight peered through the clouds. It was very difficult to find something to eat from about 11:30 AM to 12:15 when we were supposed to be downstairs to meet. It’s the time on the ship that they are transitioning from breakfast to lunch and nothing seemed to be open. The burger grill had a line of hungry passengers and they were slowly setting up all the meats, toppings, and firing up the grills. We relented and got in line for whatever they had. As we were eating, real food slowly appeared at the buffet and I managed another few plates to complete my meal. 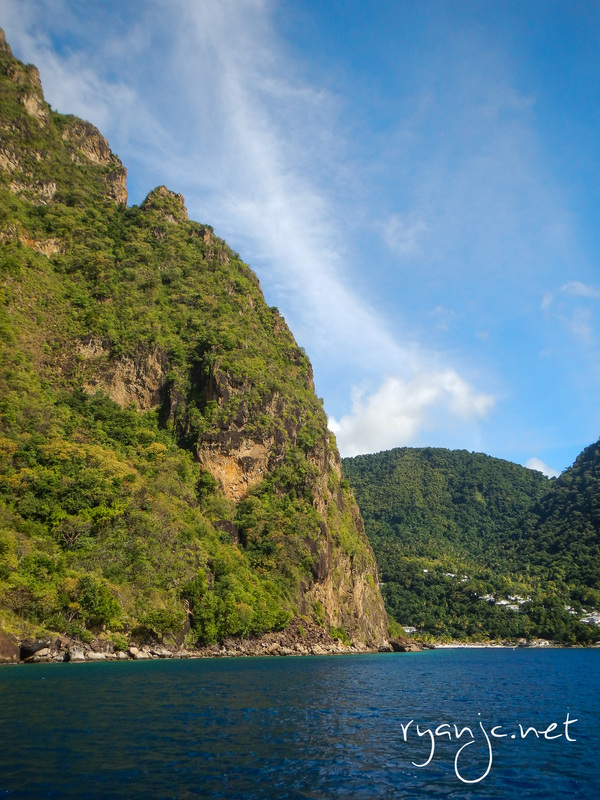 The tour we chose was snorkeling under the Pitons at Pitons Bay, home of the two famous volcanic formations in St. Lucia. They are volcanic plugs; lava has filled and sealed the vents. The each rise about 2300 feet (700ish meters). 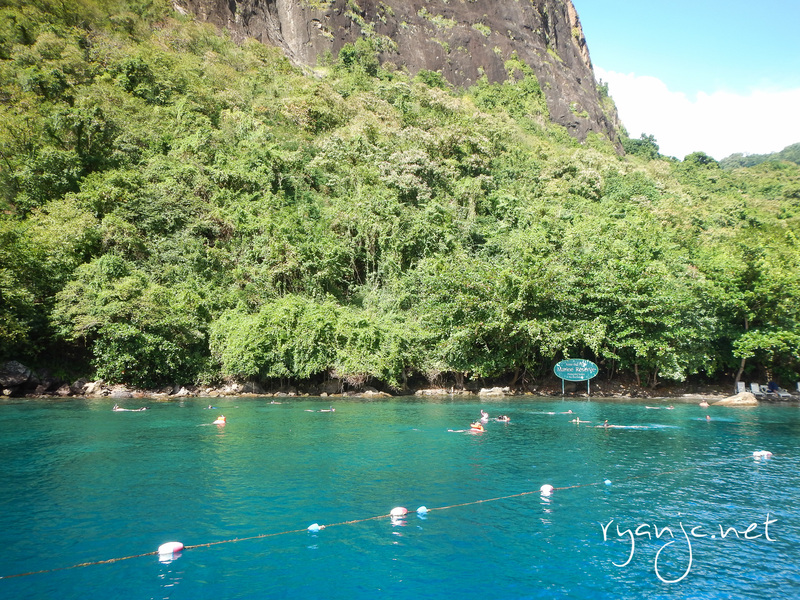 It was really neat to swim in a marine reserve directly between the two pitons. The rocky beach is very secluded and roped off to protect the marine life. There were finally plenty of fish and coral to enjoy. They aren’t the most colorful and the water isn’t the clearest, but there are some unique coral formations fish to be seen. On the half hour boat trip to and from the Pitons, it must have rained on and off four or five times. Luckily when we got to beach, it didn’t rain a drop. All in all, an adventurous fun day in the water, sun, rain, beach, and everything in between!